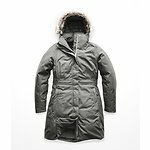 When the frigid chill races up from Antarctica and smashes into Australia, cosy up to this insulated winter coat that combines a waterproof, breathable DryVent 2L exterior with thermal 550-fill down insulation to create a resilient barrier against winter. Removable insulated hood features (zip-off) faux-fur trim for a cozy touch. Quilted taffeta lining offers next-to-skin comfort and ease of dress. This parka does everything I need it to. I find the domes very stiff to pop together but that's a minor inconvenience because the zip is terrific. The sizing is perfect after going through your system carefully. I would have liked the forest green rather than the black but I couldn't find that on sale here in NZ. Recommended.